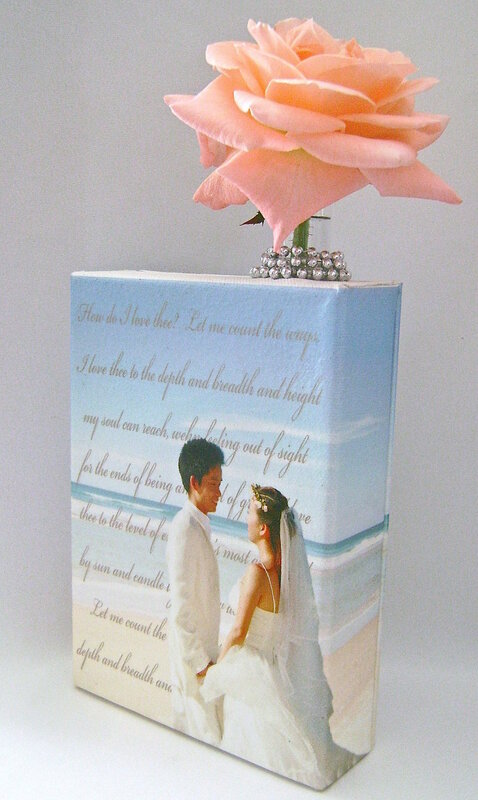 A picture of the wedding couple demonstrates just one of many ideas for this thick, two-sided canvas centerpiece. The heavy wood frame offers stability so it won’t easily topple over. The image wraps around to the back. A clear plastic “vial” is inserted into a hole in the top of the frame to hold water and flowers. The photo of the couple could show them attending their engagement party or any great moment they’ve shared. Add their favorite poem or song to make it more special. If you have Photoshop skills, you can even remove the couple from an existing photo and set them against any background. Photo layout, printing on clear film, gluing, and drilling a hole are all that’s required. Use this very personalized project as reception centerpieces or side table decor for a truly one of a kind wedding statement. step 1 - Create a page in Photoshop or a similar program to measure 8” wide and 7” tall. Bring in a 5” x 7” photo of the couple on a separate layer. Enlarge the image to fit the space. Create a new layer and type in their favorite poem or song with a script font in a medium gray color. That layer will be in front of the couple. The ideal photo will provide image area on the sides of the couple which will be used to wrap around the frame. step 2 - Arrange the type on the page so there is 1.50” margin on the left and right edge with no type, only the image. Reverse the type by flipping it horizontally. In the type layer, erase only the type that runs across the couple’s image. The result will look like the type is behind the couple. Print two copies of the page in landscape layout on Scrap Book Attitude film. 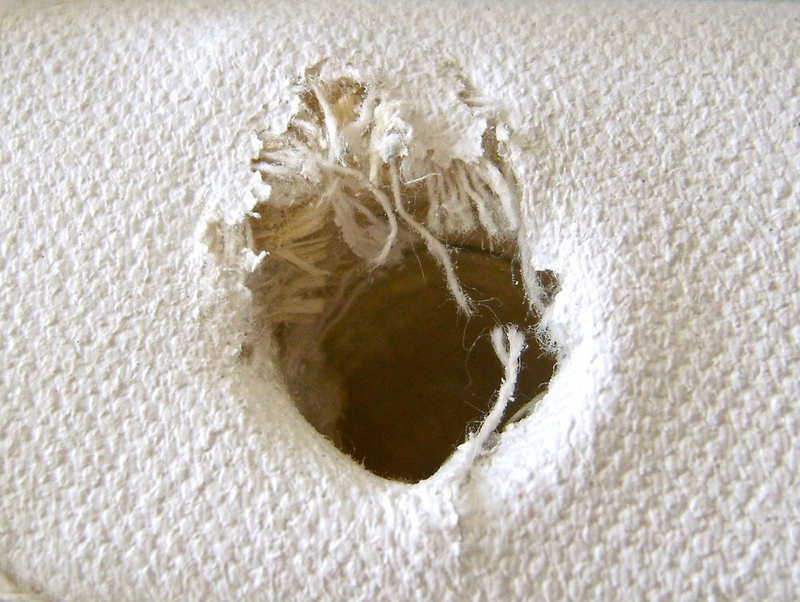 step 3 - Drill a hole in the top right of the canvas with a .75” drill bit. The hole should be 2 1/8” deep. The canvas edge will get chewed by the bit but it will be covered later. step 4 - Place masking tape across the top canvas panel to protect it from adhesive in the next step. step 5 - With Super 77 adhesive, spray the canvas front and sides. On the back, spray the thin left and right canvas edges. step 6 - Slice away the blank areas of the film at the top and bottom with a craft knife. step 7 - Remove the masking tape from the canvas. Peel the film away from the backing. step 8 - Align the top of the film to the top edge of the canvas with the text centered on the panel. step 9 - Smooth out the film and wrap the excess around the sides, then press to the back edges. Cut away excess film with scissors. step 10 - Spray adhesive on the flat 5” x 7” canvas. Apply adhesive to the back edges too. Align the second printed film to the top of the flat canvas as you did with the first image. Wrap the sides around to the back and press to secure it. Cut away excess. step 11 - Apply E6000 glue to the back edges of the first canvas. Press the flat canvas onto the glue matching up the canvas tops, bottoms and sides. The image on both canvases should match on the sides. Set a heavy object on the canvases and let the glue dry. step 12 - Insert the plastic tube into the hole at the top of the canvas. Hot glue a string of silver beads around the hole but don’t glue them to the tube. Use the tube as a guide to create a perfect circle. When your wrap is back to the start, add another flat row if necessary to hide the ragged canvas. When the flaws are covered, add another layer of beads on top of the first giving it height. Wrap three times and cut off excess. Add water to the tube and one or more flowers. Plastic Craft Tubes are used for storing beads and other small objects. Glass vials can also be used. Only the center portion of the photo appears on the canvas front. Page layout allows 1.50” on both side edges to wrap around the thick canvas.